Though Animal Intelligence will generally feature fun and interesting stories about animals and their behavior, not all of them will be quite so positive. Recently for Time magazine, Ishaan Tharoor compiled a list of animals that had been pressed into service for human wars. 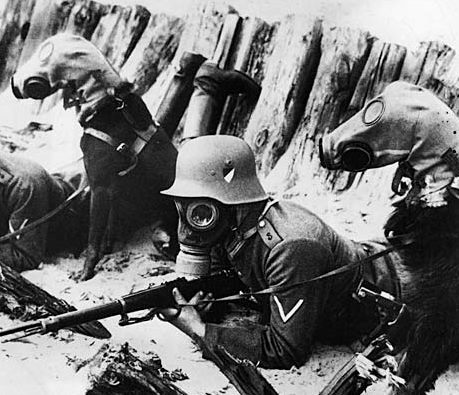 Mostly, humans have used animals in supporting roles during war. They serve as pack animals and transportation, or as tools to find enemies or weapons. Sometimes — as in the case of cows — the animals are the weapons themselves. (In this case, the cows were dead and diseased.) But recruiting actual animals do to your fighting for you? Aside from the science-fictional possibilities (Planet of the Apes! ), this seems ethically wrong on many levels. But then, one could argue that war is ethically wrong on many levels, too, I suppose. There are 2 reader responses to "Animals Go to War". The fact that non-human animals do have intelligence doesn’t give humans the right to exploit them. In fact, it leads me to the conclusion that the intelligence of non-human animals makes the case that we should not exploit them, for war, food, clothing, or other human interests. Non-human animals are sentient beings that can feel (physically and emotionally) and have an interest in living – sometimes I wonder if humans share that same capacities and interests.